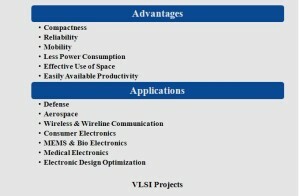 VLSI Projects ,VLSI stands for very large scale integration systems which integrate millions of electronic components in small area. We offer VLSI projects for ECE students to create IC and transistors based application projects. We ensure VLSI as emerging technology to create research in various applications. We develop latest IC and latest technology in VLSI domain. We support engineering students to develop final year projects in real time and IEEE based papers. We provide logic synthesis to analyze desired circuit behavior. By logic gates we design register transfer level and give circuit architecture for electronic devices. 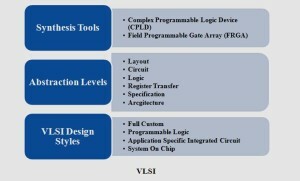 CPLD (complex programmable logic device). FRGA (field programmable gate array). It composed of pre manufactured components with programmable interconnect & computer aided design tool to reduce design effort on programmable logic device. Logo cost design with high unit cost applicable for lower performance. We provide full custom, every circuit element require handcraft. It takes huge design effort with VLSI. We ensure high performance with high design cost & low unit cost. We use system on chip to combine several large blocks which composed of predesigned custom core with intellectual property. It composed of constrained design using predefined or pre manufacture components. We adopt CAD tools to reduce design effort with low cost design. We refer scaling as process of shrinking layout with every dimension reduced by a factor. By scaling process we attain smaller, faster, conducting more electricity, and less power consuming.